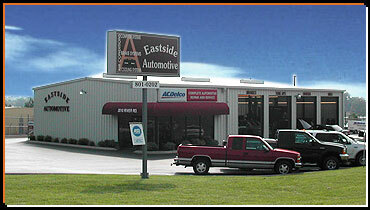 We are Eastside Automotive, and we look forward to serving your automotive needs. We have over 30 years experience in automotive repair and maintenance. We service most makes and models of cars and light trucks. We're now offering Alignment Services! Whether you need alignment, an oil change or a new engine, our ASE certified technicians will get you back on the road quickly. Be sure to download and print out our coupon for great savings (some restrictions apply). If you don't need any service right now, just stop in to say hello. We'll be glad to see you! Website designed and maintained by Pixel & Paper Designs.